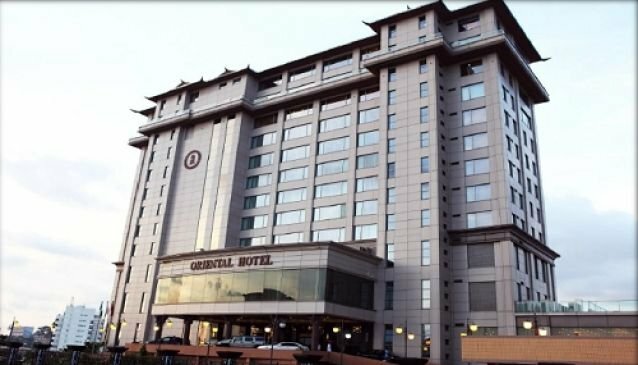 Lagos Oriental Hotel is a premium, luxurious hotel located on the shore of the Lagos Lagoon, in the heart of the Victoria Island, along Ozumba Mbadiwe and just before the Lekki tollgate. The hotel has a wonderful team that strives to ensure you will have the best stay, meal or event. The lobby of the hotel is well decorated, beautiful and accommodating. There are several restaurants and bars where you can relax. The terrence is a wonderful place to sit with a newspaper and have breakfast as the sun rises above Lagos. The hotel is in a good location to access many of the businesses and points of interest in Lagos. You can get a boat just behind the hotel. The hotel is walking distance from The Palms Shopping Mall, a top spot for many Lagosians to have eat, watch movie, meet people.